In most European countries, refugee reception and resettlement have historically been highly centralized government functions. Yet as national asylum systems saw their capacity stretched to a breaking point during the 2015-16 crisis, new grassroots efforts began to crop up across Europe to offer newcomers shelter, food, clothing, and a sense of welcome. 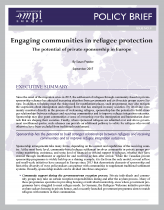 In addition to playing a critical role in a time of crisis, these initiatives also sparked debate among European policymakers and civil society about whether there is something to be gained by involving community groups and private citizens more directly in the refugee resettlement and integration process. This policy brief explores the broad spectrum of approaches to refugee settlement that include elements of community-based or private sponsorship—from the large and well-established Canadian program to smaller-scale and ad hoc initiatives in Europe. While these approaches vary widely in scope and the types of responsibilities sponsors take on, the author finds that governments and their civil-society partners generally face three common challenges when implementing them: balancing thorough program design with pressure to act quickly, providing government oversight and support without displacing willing community leaders, and cultivating strong working relationships between all parties involved. When done well, however, such programs hold the potential to foster important relationships between refugees and their neighbors and to improve integration outcomes in the long run. A. What Is Refugee Sponsorship? B. What Is the Added Value of a Community-Driven Approach?